i PLAY GOLF! Do U? Mini Golf is the miniature version of Golf game which is played on a very compact Golf Course (Mini Golf Course) just using a putter and a Golf ball. As in real Golf, mini golf courses usually have nine or eighteen holes and the objective is to hit the Mini Golf ball into the hole with as few strokes as possible. The thing that makes mini golf attractive is the array of weird and crazy obstacles that are positioned on every hole, hence making the public come back for more after every round. Mini Golf is the most popular form of Golf entertainment for people of all ages. These are indoor structures constructed inside various commercial & retail complexes, hotels and even houses. It is unaffected by the outside weather condition, hence it can be operational throughout the year. It is usually made of felt carpets or artificial turfs on high quality wooden frames. Space required by an average Indoor mini golf Course can range from 1000 sq. ft. to 5000 sq. ft. It costs between Rs. 5 to 10 Lacs. It takes 1-2 months to construct. 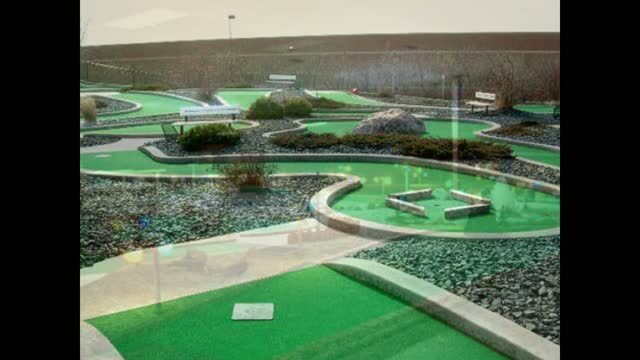 These are the most common type of Mini Golf Courses in the world. They are usually made of fiber cement, concrete or same as Indoor one on high quality wooden frames with astro-turf. Space required by an average outdoor mini golf course can range from 3000 sq. ft. to 10,000 sq. ft. It takes 2-3 months to construct. These types of courses feature the most creative and crazy concepts in Mini Golf design. It consists of 9 to18 holes with numerous hazards, obstacles , twists and turns on each hole. Each hole can be of any shape and size. Space required by an average Adventure Mini Golf Course ranges from 2000 sq. mts. to 5000 sq. mts. It costs between Rs. 25 to 50 Lacs. Mini golf is played on courses consisting of a series of holes (usually a multiple of 9 or 18) similar to its parent, but characterized by their short length (usually within 10 yards from tee to cup), the use of artificial putting surfaces such as carpet, Astroturf and/or concrete, a geometric layout often requiring non-traditional putting lines such as bank shots, and artificial obstacles such as tunnels/tubes, ramps, concrete/metal/fiberglass forms, and moving obstacles such as windmills. Area needs to be developing mini golf around 500 SQM to 2 Acre or would be design as per available land with landscape. International sports organization World Mini Golf Sport Federation (WMF) prefers to use the name “mini golf”, the general public in different countries has also many other names for the game: miniature golf, mini-golf, midget golf, goofy golf, shorties, extreme golf, crazy golf, adventure golf, mini-putt and so on. The name Putt-Putt is the trademark of an American company that builds and franchises miniature golf courses in addition to other family-oriented entertainment, and the term “putt-putt” is sometimes used colloquially to refer to the game itself. The term “Mini golf” was formerly a registered trademark of a Swedish company that built its own patented type of mini golf courses. India has lot of opportunity to spread mini golf as an adventure, sport, entertainment for kids and adults too to get interest to play golf at schools, holiday places, Malls, Tourist point, Public parks, Community clubs etc. 1.Feasibility and Inception: AVGI provides our clients a best possible report to build a mini golf course on particulars site; we start from site visit and data collection like soil & water sample to analyses of physical & chemical properties, adjacent area. 2.Planning and Coordination: Our professional team prepares all required detail for construction of a mini golf course like bill of quantities & proposed estimate, enlisting contracting agencies & suppliers, golf course construction schedule from 0 day –critical project method (CPM) network. We share feasibility reports, budget & locally available material detail with designer to build a sustainable & financially viable golf course and driving range. AVGI providing our clients with high quality project management services which meet requirements and delivered within required timescales and within budget. Survey and Stacking of golf boundary or fencing, Site clearance. Earth work, Construction of lake, cart path, bridges, refreshment point, fencing. Formation of soil profile as given specs with best agronomical practices. Grassing and planting, Installation of synthetic turf and open to play and Handover to Grow-in Maintenance team. We give full support to our clients to operate mini golf with marketing and sales promotion and arrange training to site staff that how to maintain and operate. Operating the business to the systems required and AVGI quality management system to continually improve effectiveness. Enhancing the skills of management and staff through review and actively pursuing an on-going training policy to help achieve targets. Promoting the quality management system and to review and revise this policy as necessary at regular intervals. Carnoustie Beach Resort and Ayurveda Spa.